Finally, a solid artbook for the Metal Gear Solid franchise. I've reviewed a couple of MGS artbooks before, such as the Japanese artbook for MGS4, English one for MGS5 and Ashley Wood's interpretation of MGS. I've always wondered why there aren't any English artbooks for MGS I to IV until now. I guess the games are now so popular that it warrants coming out with this ultimate artbook collection. The Art of Metal Gear Solid I-IV is a two-book set housed in a huge slipcase. When I first saw this collection, I was nodding my head in acknowledgement. This is the type of collection that fans deserve. The two books total 800 pages. The binding is excellent for such thick books. The edge of the pages are trimmed with silver paint for that extra something. But be careful when flipping the pages because the silver trim can cause pages to stick together. Not just that, some of the heavily printed pages may also stick together at the edges. It's a minor issue. You just have to peel off a few pages carefully, that's all. The first book "Studio Works" is the collection of black and white concept art of characters, enemies, mechs and some set interiors. You'll get to see lots of sketches. You may have seen characteristic brush-style MGS art online. There are loads of them in this book. The second book "Gallery Works" features coloured illustrations. The style is similar to the first book, but with colour. There are also several high resolution 3D renders of the characters. The books only cover the first four games. 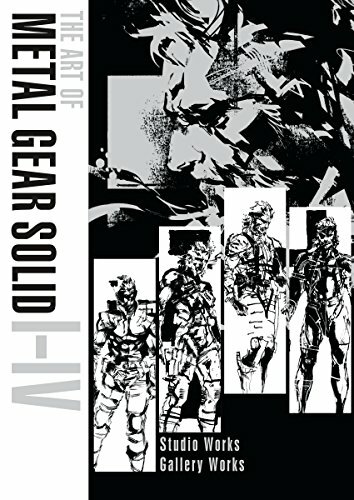 Since there aren't any artbooks for the first four games except the Japanese artbook for MGS4, this can be considered the ultimate art collection for MGS. The art is fantastic and needless to say, it's a must-buy for MGS fans. Hi Parka. If you have the first four japanese versions of these books, Is it worth to buy this english version? While most of the sketches and drawings are the same, I see others that don´t appear in the books. If you already have the other MGS artbooks, you already have most of the art so there's not much point getting this set. Yeah, some artworks are new so it really depends on how much you want the complete collection of art.